A robust wine glass for any occasion and every need. A true fusion adventure based on Eastern traditions western technology and professionals from the world of wine. 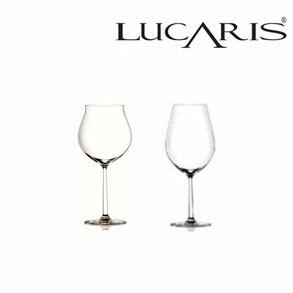 Lucaris is the most interesting and serious Asian manufacturer of stemware for wine lovers worldwide. Glass blowing expertise from Toyo-Sasaki in Japan and Ocean Glass in Thailand is merged with the most advanced technology from Germany. The result is exceptionally clear and extremely strong lead-free crystal glasses of the highest grade and with the same aesthetic expressions as traditional crystal. The design is performed by award-winning German designer Martin Ballendat, and the joy of wine appreciation has been paramount throughout the whole process. Professionals in the hospitality industry worldwide celebrate these excellent titanium glasses for their low price and high strength. The glasses are incredibly robust and really can withstand a quite a lot. See for yourself in this video. 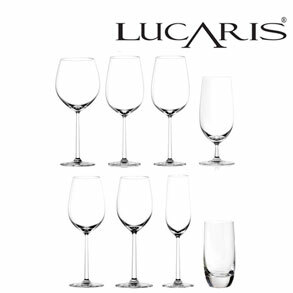 The Lucaris stemware are also incredibly cheap compared to competitors’ products. 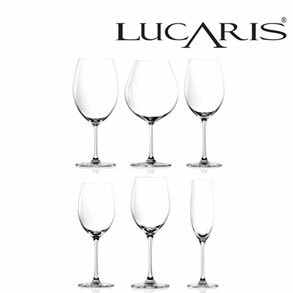 That is why Lucaris wine glasses are frequent test winners. The glasses are designed for casual gatherings and fine dining where a sense of style is essential. 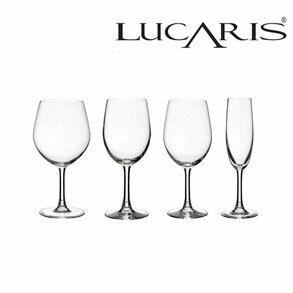 The series includes three kinds of red wine glasses, two white wine glasses for light and full bodied white wines, a champagne flute and a water glass. In Tokyo, state-of-the-art technology and ancient traditions intertwine in everyday life. With the series Lucaris wish to "reinvent constant modernity by embracing futurism along with historical values". The breathtaking city inspires the Tokyo Temptation series with a modern version of classic appearance designed for modern gourmet dining, where glamor and formality are at the forefront. Three red wine glasses called Bordeaux, Burgundy and Cabernet are complemented by Chardonnay and Riesling as well as the elegant tall glass for Champagne. Hong Kong is a remarkable Asian metropolis that is always at the forefront as a truly unique fusion of Eastern and Western cultures. The Hong Kong Hip Series is inspired by this unique lifestyle. With their modern and edged silhouette the glasses are clearly stylish and perfect for occasions where the finest wines and the most fashionable food are served. Three red wine glasses, a white wine glass and two cocktail glasses emphasize the urban look of the beautiful glass. The city of Shanghai redefines exquisiteness and creates a sense of luxury through old wisdom and modern ingenuity. Lucaris' Shanghai Soul Series is inspired by this flamboyance. 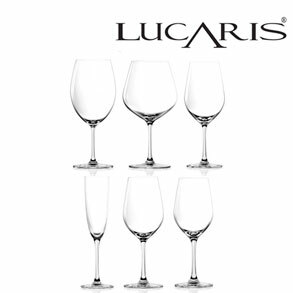 The glasses are intended for top-shelf wines that deserve the highest standards in glasses. 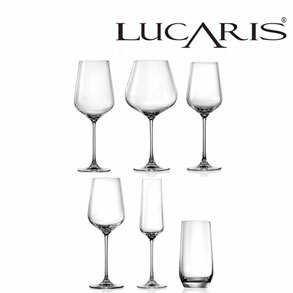 In addition to cost efficient red wine glasses and white wine glasses, Lucaris' Shanghai Soul stemware is distinguished by presenting a wide selection of glasses for cocktails, distillates and beer. As an additional treat this series also presents the Shanghai Soul Grande. Two large and stylish wine glasses for Burgundy and Bordeaux respectively. The Desire series is also called Masters' Choice Collection, and here attention to the technical details is in focus. In addition to being robust and beautiful titanium wine glasses, there are a number of curl lines in the bottom of the inside of the glasses. These curls help aerating the wine when you swirl the wine in the glass. The result is enhanced aromatic pleasure for you as the wine opens faster than with a conventional glass. 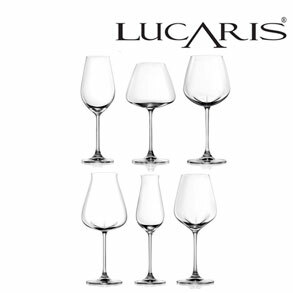 The individual glasses have names other than the rest of Lucaris's range. Instead of geography or grape varieties, the names of the glasses refer to the type of wine meant to fit best in the glass. The red wine glasses are called Elegant Red and Robust Red, the white wine glasses are called Crisp White and Rich White and the Champagne glass is called Sparkling. Finally, there is the Universal Glass, which can be used for virtually any wine as desired. For example, try pouring a great Port wine in such a glass and your senses will have a ball.